This is the ultimate vacation for those of you who love thrilling rides and taking to the slopes! Once you arrive in Eureka, you'll instantly feel the small hometown feel of this little railroad stop on Route 66! So get your family and friends together for a vacation that you will remember for years to come! We'll provide the place to sleep, cook, and relax. All you need is yourself, food, and clothes, of course! Experience the beautiful parks and outdoor events St. Louis County has to offer and wonderful people who live here, and I'll know you'll be coming back for more! I am a native to St. Louis and I have been renting my properties for 10 years now and loving every minute of it! I even rent out my personal home which many guests return year after year! I lost my husband 9 years ago and while it wasn't easy all of my guests kept me going, so I appreciate each and everyone of you! This year 2019 is the year I am remodeling so I can compete with all the new and beautiful vacation rentals. But you know what they say, LOCATION, LOCATION, LOCATION! Happy Travels to all! My late husband and I purchase this building in 2001 for our company office. There were several other businesses' here with us. I began remodeling 9 years ago when the businesses left and purchased new furnishings, beds, furniture, etc... And now it's time to do it again! This is a 4 plex building and every entrance is on different sides of the building with semi-private decks or patios. We are close to dining, grocery stores, Six Flags, Hidden Valley, and within 30 minutes of all that St. Louis has to offer and that's ALOT! Above and beyond you will love the location of this building, the easy access to Hwy 44, the privacy for the location, and warm feel of the interior. Tiled shower with a window, small sink, toliet, and linen closet. Hidden Valley Ski Resort is just 2 miles away for your snowboarding and skiing pleasure! The Meramec River is nearby for you and your guests to float and have a good time! Check out Brookdale Farms for your rafting and canoe rentals. Plenty of off street parking for 10 vehicles! YMCA just 1 mile away!!! 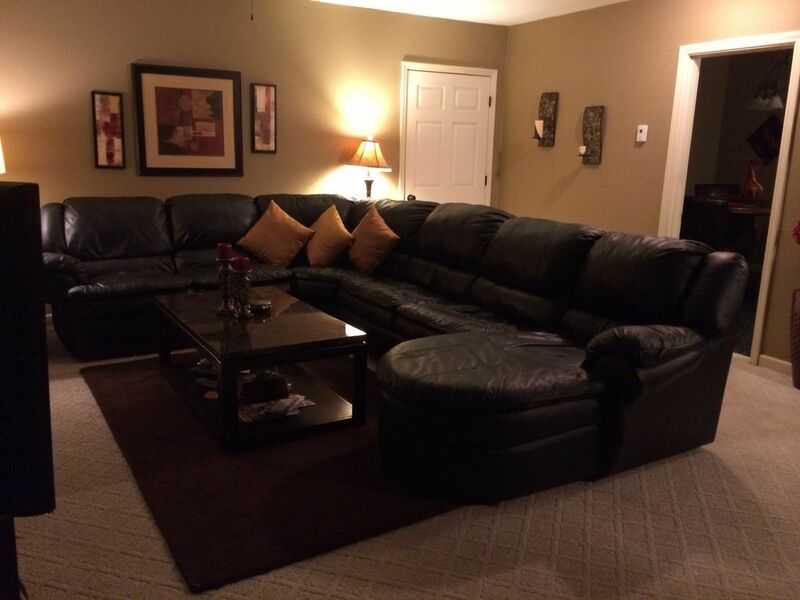 large leather couch to relax after a fun day exploring St. Louis, or being at Six Flags, or skiing at Hidden Valley! This building of 4 villas sits on 1.3 acres! There is a lot of lawn to go out and play games or let your children burn of extra energy in a safe area! Kayak/Canoe at Twin Rivers Canoe Rental 2.8 miles or rent at Brookdale Farms nearby for a 9 mile float for 3.5 hours of FUN! Patio with two table 5 chairs and a propane grill. All patios and decks are private from one another, at this 4 villa complex. Ski & Snowboard at Hidden Valley Ski Resort just 2 miles away! Golf nearby at Pevely Farms Golf Club, Fox Run Golf Club, Cresent Farms Golf Club, Aberdeen Golf Club, or Robert Trent Jones 18 holes at The Legends Country Club. There is a walkway in front of the building that if you park by Ste A you can stay underneath the overhang and arrive at Ste B's door and with a little assistance roll right in. The shower is not handicap accessible but with assistance and a separate chair I believe you could manage. Great stay for a great price. Donna was amazing to help accommodate us in anyway we needed. Everything was great and no complaints! Thanks Donna! The place was fantastic!! Completely secluded and well stocked with the necessities! The place was fantastic!! Completely secluded and well stocked with the necessities! We wish we could have spent more time there! We were moved into listing 716809. Donna let us know that we were going to be moved into the home and communicated well with us throughout our trip. The home was in a nice area and the outside was so private. The inside was very nice. The open floor between the kitchen and living was so nice. You could visit with the whole family and not feel crowded in one area. I would highly recommend this home to anyone that likes rural areas and watching deer cross through the yard at random times of the day. Thank you Donna for letting us enjoy this beautiful area and answering all of our questions. Very clean comfortable. Close to everything. Definitely would go back. Very convienent ! Owner is good to work with! The 5 bedroom villa was perfect for our big family. The kitchen had everything we needed to cook big meals every evening. The bedrooms had big beds and lots of room. The bathroom was full of towels and there was plenty of sitting space throughout the house. I recommend this rental property to anyone. The owner, Donna, was at the home to greet us when we arrived and made sure we were comfortable. She was super sweet and she recommended some great places for us to take our kids while we stayed in St. Louis. We had a great time and a comfortable stay. We will be returning and staying in the same villa the next time we come and visit St. Louis. You will find something appealing around every turn in St. Louis. If golfing is your pleasure you will find dozens of courses. If it's the nightlife you thrive, you will find many venues playing a wide range of music to suit everyone's listening pleasure. Families, we've got you covered also, take the kids to a baseball game at Busch Stadium, home of the St. Louis Cardinals, visit Six Flags St. Louis, just 1 mile east of this property, or the newly expanded St. Louis Zoo, explore the nationally recognized Magic House and th en it's your turn to shop til you drop at West County Mall or The Galleria. The list goes on and on! So what are you waiting for, give me a call and make your reservation, time is slipping away for this summer season and the winter season will be booking up fast! Don't worry though, when this villa is rented out, I also have a beautiful luxury estate situated on 7 acres with 4 bedrooms and 4 bathrooms just 50 minutes from downtown St. Louis. If you need additional bedrooms/bathrooms there are 3 more Villa's in this building. Check out www.Vacationrentals.com #7058776 and www.VRBO.com #468352 #485697 #7058776 is a 5b/1b next door #468352 is directly below and is a 3b/1b #485697 is a 3b/1b with 4 beds next to #468352 Call me for additional information. All Villa's have their own separate entrance's and patio's and/or decks.